When you build a wood project, there’s a good chance that there will be some glue involved. And when there is glue, there is a high probability of seeing wood glue squeeze out. In fact, if you don’t have some amount of wood glue squeeze out, it is likely that you have not applied enough glue to the joint. Wipe it with a damp cloth right away. This approach can cause adhesion problems if water is driven into the glue joint, compromising the glue’s strength. Let the wood glue squeeze out partially cure, then scrape. This strategy takes advantage of the rubbery state that wood glue achieves as it transitions from liquid to solid, which can allow you to remove it fairly easily with a sharp chisel or a wood scraper. Each of these approaches can work well on flat surfaces, but using either of them to remove wood glue squeeze out in a tight corner can be problematic. George has come up with an approach to removing wood glue squeeze out in this situation that uses a free device available at any fast food restaurant or malt shop. Once you have mastered this technique, you might want to explore a few more tips on cleaning glue squeeze out. You may just have found a new home for your old, worn out socks. Dave Munkittrick gives a quick and handy woodworking tip to prevent clamp scars that can damage your wood. Socks can help avoid the crippling effects that hand clamps are liable to have on your woodworking projects. 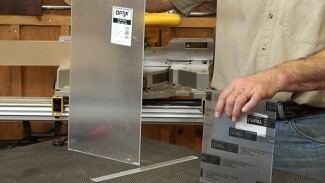 Have you ever wondered what the differences are between acrylic and polycarbonate glass? George Vondriska explains what sets them apart and discusses some of the various woodworking projects that require each type. 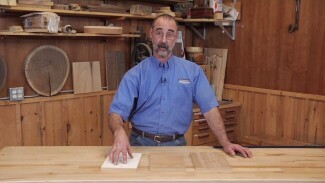 Watch and learn which type factors into your next woodworking plans. Have you ever wanted the ability to raise and lower the benches in your woodworking shop while working on various projects? 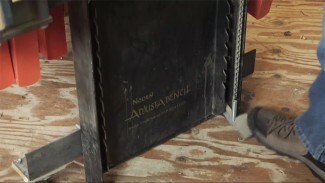 George Vondriska shows you how valuable and easy it is to have an adjustable bench in your shop.